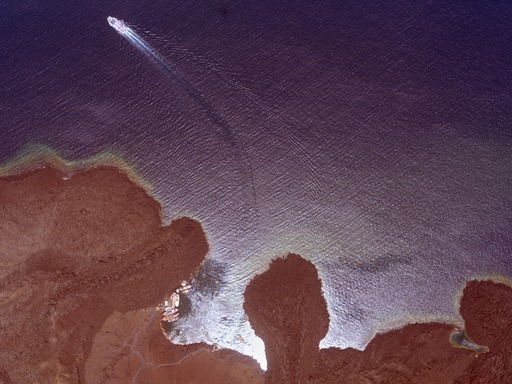 The island of Nea Kameni (‘burnt island’) is the youngest part of Santorini volcano, and a major tourist site. Santorini is a subduction-zone volcano, and is one of the active volcanoes of the Southern Aegean Volcanic Arc. These volcanoes have formed in response to the continued, slow, sinking of the African plate northwards beneath the Eurasian plate. The present day boundary between these plates is marked by a trench a little south of the island of Crete. Santorini itself lies about 120 km above the Benioff zone that marks the likely location of the top parts of the subducting slab. Santorini last erupted in a tiny eruption in 1950, from a small vent on the island of Nea Kameni, or ‘new burnt island’. The two Kameni islands are just the top of a mound of lavas and lava-domes that have extruded from the volcano over the past 3,500 years, and that now form the main centre of the volcano in the middle of the caldera. Santorini is best known for the effects of a huge explosive eruption about 3,600 years ago – known as the Minoan eruption. This devastating eruption, which is certainly one of the largest eruptions in the world from the past 10,000 years; and one of the largest eruptions in Europe of the past 40,000 years, scattered ash and pumice across millions of square kilometres, and probably led to significant economic and political disruption in the Bronze Age eastern Mediterranean. How does Santorini stack up as a Top Trumps Volcano? The scores on the cards are based on what we know about the past eruptions of Santorini. Explosivity (Volcanic Explosivity Index) – 7. The volcanic explosivity index is one simple measure that it is widely used to categorise the ‘size’ of explosive eruptions. The scale is a little bit like the Richter scale for earthquakes, and it runs from 0 (non-explosive) to 8 (largest known explosive eruptions from the past 100,000 years. Santorini has a long history of large explosive erupti0ns, with about 12 major eruptions known so far from the past 350,000 years. The Bronze-Age ‘Minoan’ eruption ranks at about 7 on the volcanic explosivity index, since it ejected somewhere between 30 and 90 cubic kilometres of magma during this eruption. Volcanologists are still trying to piece together the details of this eruption, but since most of the ash and pumice thrown out during the eruption ended up on the sea floor, tens to hundreds of kilometres away from the volcano, it is still quite hard to know exactly how large the eruption was. Height – 367 m. This summit height is taken from the Smithsonian Global Volcanism Program database, and represents the highest point on the present-day crater rim of Santorini. In this example, though, this height is not the height of the current vent above sea-level (this is more like 100 – 120 m; the summit height of the Kameni islands); and it is not the highest point on Santorini – which is, instead, the summit of the mountain of Profitis Ilias, which is the peak of a large block of ancient limestone around which the volcanic islands happen to have grown up. Deadliness – 5. The deadliness index is calculated from the numbers of known deaths associated with activity at the volcano. In the case of Santorini, we have no information on the number of casualties caused by the Minoan eruption, 3600 years ago. The archaeological evidence suggests that there may have been an extended period of precursor activity before the main eruption, since the port town of Akrotiri (which is now fabulously preserved as an archaeological site in southern Santorini) appears to have been evacuated before being buried under several metres of pumice. There has been one very damaging eruption near Santorini during the past 500 years. An eruption in 1650 AD of a submarine volcano, called Colombos, which lies just a few kilometres north-east of Santorini was reported to have triggered a tsunami that swept across the eastern parts of the island; and released noxious gases. About 120 people died as a result. Wow factor – 87. While everyone will have different opinions of what the ‘wow factor’ is when it comes to volcanoes, it is pretty hard to beat the view as you come in to Santorini by boat. Santorini regularly features in ‘top ten’ lists of places to visit, or holiday. Unpredictability – 51. Santorini is a volcano that has both very large explosive eruptions, and also extended periods with much smaller, weakly explosive eruptions. It has been in a phase of repeated lava and lava-dome eruptions for most of the past 3000 years, and this will probably continue into the future. But since we don’t yet know why it flips between these two different sorts of activity, this still makes Santorini a fairly unpredictable volcano. Devastation Potential – 684. Santorini is a large caldera volcano, with a well known history of large and damaging eruptions and, on geological timescales, this will probably happen again. Fun Fact – many people have speculated that Santorini might be the location of the lost city of Atlantis, a ficti0nal island first mentioned by Plato. General Resources about Santorini Volcano. There is a lot of accessible information about Santorini which can be easily found on the internet. We have posted a few suggestions for further reading below. Do let us know if you find anything that is more useful or up-to-date. Volcano Discovery web pages about Santorini and its volcanic history. Santorini.earth.ox.ac.uk – an introduction to a recent minor episode of unrest on Santorini, in 2011-2012.
ismosav.santorini.net – webpages maintained by the Institute for the Scientific Monitoring of Santorini volcano, explaining the ways in which the volcano is monitored.